Today I am going to present you a Simple Transistorized one Minute Delay Timer Circuit. It doesn’t include any complex or critical parts. 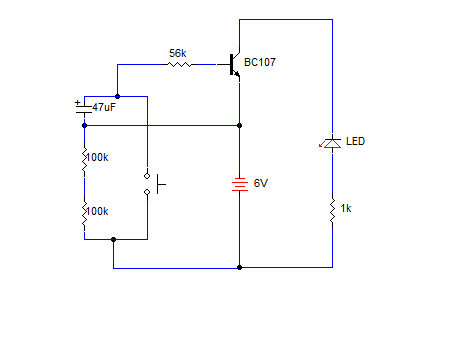 You can use this circuit to generate a time delay of about one minute. 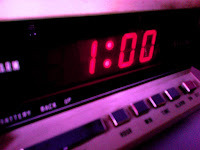 That is, When you press the switch (Push button type is preferred) the LED turns ON and it prolongs for a 1 minute time. By pressing the switch, the capacitor starts charging towards 0V through the 100K resistors and at the time of release, the capacitor discharges the stored charge through the 56K resistor. 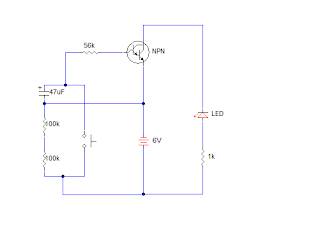 This makes the NPN transistor forward biased and it appears as a closed circuit for the LED and battery. That makes the LED to glow. The 1K resistor is used as current limiting, for the protection of LED. It is possible to use a relay instead of LED, to control external devices. 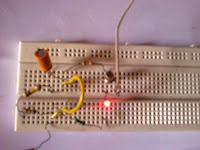 The circuit remains ON till the discharging of capacitor made completed.